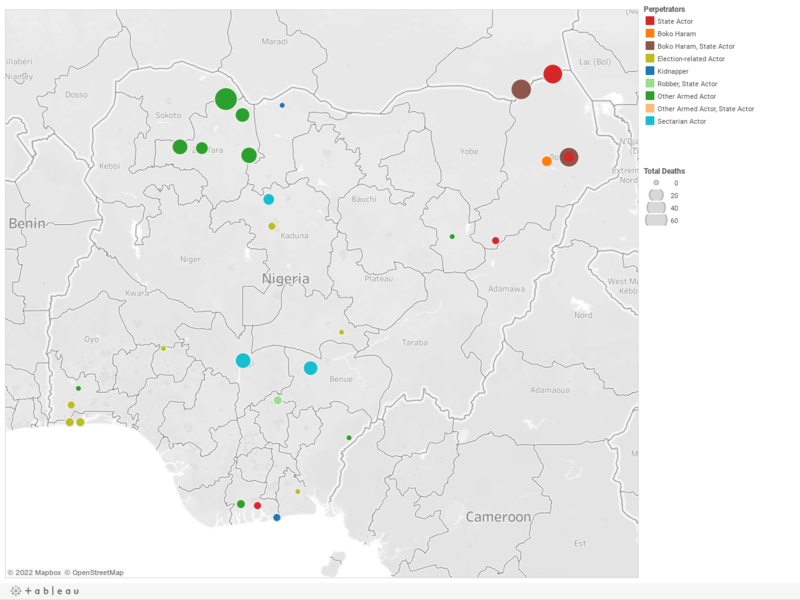 Below is a visualization and description of some of the most significant incidents of political violence in Nigeria from March 2 to 8, 2019. This update also represents violence related to Boko Haram in Cameroon, Chad, and Niger. These incidents will be included in the Nigeria Security Tracker. March 2: Gunmen killed seven in Giwa, Kaduna. March 2: Herdsmen killed sixteen in Gwer West, Benue. March 2: Gunmen killed two soldiers in Akuku-Toru, Rivers. March 3: Bandits killed forty in Shinkafi and Anka LGAs in Zamfara. March 3: Bandits killed twenty-three members of the CJTF in Tsafe, Zamfara. March 5: Bandits killed thirty members of the CJTF in Shinkafi, Zamfara. March 6: Five were killed by a landmine suspected to have been planted by ISWAP in Maiduguri, Borno. March 6: Nigerian troops killed seven Boko Haram militants in Shani and Mafa LGAs in Borno. March 7: Sectarian violence led to twenty deaths in Bassa, Kogi. March 7: Election-related violence resulted in two deaths in Lagos State, Lagos. March 7: Election-related violence resulted in one death in Ifo, Ogun. March 7: Bandits killed twenty in Bukkuyum, Zamfara. March 8: Election-related violence resulted in two deaths in Ojo, Lagos. March 8: Seven soldiers and thirty-eight Boko Haram militants were killed in a clash in Diffa, Niger. March 8: Nigerian troops killed "many" bandits (estimated at twenty) in Bukkuyum, Zamfara. March 8: Nigerian troops repelled a Boko Haram attack in Mafa, Borno, killing "scores" (estimated at twenty-four) of militants.